There are lots of different tools for monitoring the performance of your social media marketing efforts, but one of the best ones is actually free, and what’s more, it’s already fully integrated with Facebook. Facebook Insights is a tool developed by Facebook themselves in order to help businesses to analyse the performance of their activities on the popular social network in order to gauge what is working – and what isn’t. It has long been highly valued by marketers as a data source for helping to drive strategic marketing decisions. Unfortunately, it also used to be a bit clunky, and to access many of the most useful metrics you had to export the data to a spreadsheet and do your own calculations, or plot your own charts. 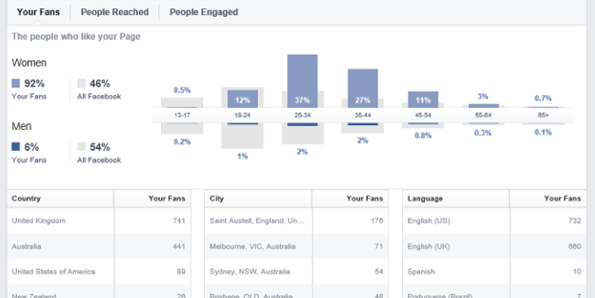 Thankfully, Facebook cottoned on to this, and recently rolled out a thoroughly overhauled version of Facebook Insights to provide users with easy-to navigate graphs and clear data sets for all the available information. This means that in almost every case you don’t have to export the data to Excel to find the insights you want, although the export function is still available. In this series, we’re going to be taking you through all the features of the new version of Facebook Insights and the data it makes available to you, making it easier to achieve your social media marketing ambitions. The Insights box is in the bottom right corner of your admin panel, to the right of the Get More Likes box. To see your latest insights, click on See All (top right corner). This is the first page that you see when you visit the new Insights, showing information about your ‘Likes’, post reach, and engagement, which is the number of people who click anywhere on your post. It also shows a snapshot of your five most recent posts together with information about their reach and engagement. From here, you can see the overall trends in terms of the number of people liking your page, and find out a bit more about where these new likes came from. With the old Insights, you used to have to select from a range of drop-down menus to view likes for a particular week, but in the new version you can just click and drag inside any of the graphs to get the data for that particular time frame. The ability to see the source of your new likes – whether they be from your page, page suggestions, mobile, your posts, or other sources – is another useful new feature. This tab can give you a broad picture of how well your page is doing, and what is driving this performance. In previous versions of Insights, you had to export this data and analyse it yourself using a spreadsheet. However, in the new version, you can get a much clearer picture of where your engagement is coming from, be it likes, comments or shares. This gives you an idea of areas that you need to work on, and things that are working well that you need to keep going. This is one of the most useful of the new features, as it allows you to see exactly which parts of your page are being visited. Of course, you would expect people to view the landing page – which will be the timeline unless you specified otherwise – but how many people are viewing your ‘About’ page, or your photos tab? Crucially, it enables you to see the tabs that aren’t getting visited very much, in which case you can replace them with something that might appeal more to visitors. Another handy aspect of this tab is the ‘External Referrers’ chart, which allows you to see where the visits have come from, which can be very helpful for targeting your marketing efforts in future. For example, you can see if much traffic is coming from your own web page, Twitter, email, or Google search, so if one side of things isn’t performing particularly well, you can beef up your efforts in that area, or choose to focus more on the things that are working well for you. In social media, as in comedy, timing is everything. Even the best, most potentially response-provoking post might disappear from people’s news feeds if it gets posted at the wrong time (ie when none of your customers are online). That’s why it’s worth using analytics to work out exactly when your posts are performing at their best. Previous versions of Insights lacked this kind of feature, which led many businesses to turn to Google Analytics to find out, but they have corrected this oversight in the new version. This shows when your fans were online in the past week, and should give you a rough indication of the trend. However, for a more accurate indication, it’s better to measure it over a few weeks as this will give you a less localised view. Below this chart you can find information about your posts, including their reach and engagement levels. 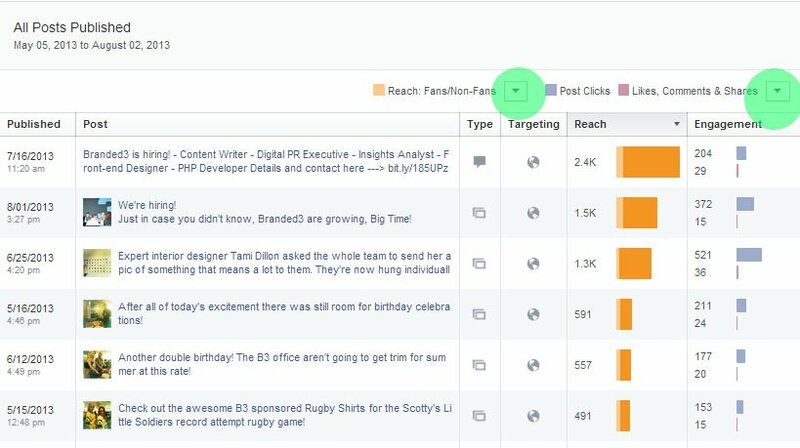 You can change what is being displayed in the reach and engagement columns – for example to see how many people are hiding your posts or reporting them as spam, by clicking on the buttons highlighted below. This tab enables you to get to know your audience a bit better, in terms of who is liking your page, and who is engaging with your posts. This feature was available in previous versions, but it now provides more data about the people that engage most with your content, such as age, gender, and location.